Are you a pure-blood wizard? A Draco Malfoy action figure for you Slytherin supporters! Boasts a screen-accurate facial expression and detailed skin texture. Includes interchangeable hands, a fabric Hogwarts uniform, a light-up lamp, and more! Are you a pure-blood wizard? If not, rest assured that Draco despises you. Draco Malfoy, son of the illustrious Lucius Malfoy, is ready for whatever Hogwarts has in store, and this Harry Potter Sorcerer's Stone Draco Malfoy 1:6 Scale Action Figure inspired by Harry Potter and the Sorcerer's Stone stands approximately 10-inches tall with an articulated body and a specially hand-painted head sculpt with screen-accurate facial expression and detailed skin texture. 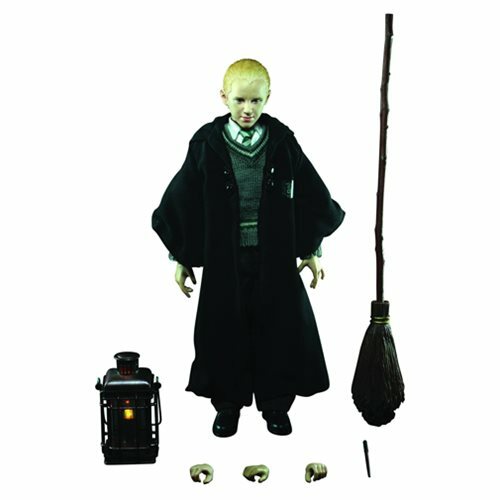 Draco comes with 5 interchangeable hands (1 open pair, 1 wand/lamp-holding hand, 2 broomstick-holding hands, 1 left, and 1 right), a fabric costume (white shirt, striped tie, school uniform trousers, Slytherin knitted-pattern sweater, black wizard's robe, black socks, and black shoes), a lamp (batteries not included), a learning broomstick, a wand, and a figure stand. How about that, Muggle? !